Carys Hannah Ward is 6 years old and is already showing that she has the makings of an outstanding artist! The whole team at Eds Up were impressed by her sensitive use of colour, the detailed observations and the sheer vitality of her painting. 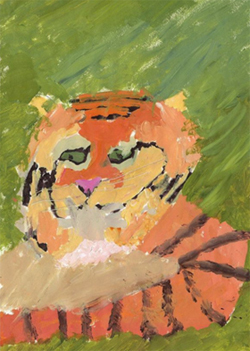 Carys tells us that whilst she has never seen a tiger in the wild, she has looked at the work of many ‘real’ artists and has learned a lot from her visits to art galleries, including the Pompidou Centre in Paris which really inspired her. Carys, who is at school at Pembridge Hall in London, also studies at the studios of Lisa Jayne in Radford, Oxfordshire. Although she started by attending Lisa’s holiday workshops for children, Carys loves painting so much that she has been invited to join the adult classes on certain afternoons! We think that Carys will be a name to watch in the future – but she may be calling herself Hannah – the name she would prefer to be known by when she gets older!